All about Hybrid Macaw parrots, learn about Hybrid Macaw development and the characteristics of hybrids, colors and personalities, a complete Macaw hybrids list with pictures of all the types of Hybrid Macaws. All about Large Macaw parrots, the types of Large Macaws and keeping Large Macaws as pets, bird guides for each species with pictures. Macaw Facts and Bird care guide for Macaw parrots, all about pet Macaws from macaw behaviors and lifespan, macaw training, handling and bird toys, to selecting macaw cages and bird food. All about Mini Macaw parrots, the types of Mini Macaws, keeping Mini Macaws as pets, bird guides for each species with pictures. Though the Caloshua Macaw is a very large bird, it is very sweet natured when well socialized! The Caloshua Macaw is a hybrid cross between a Blue and Gold Macaw and a Hyacinth Macaw . It is a first generation macaw, meaning its parents are two species of naturally occurring macaws.The Blue and Gold Macaw has been one of the most popular pet birds in the trade. The Hyacinth Macaw is a majestic, but quite pricey bird, that most macaw enthusiasts would love to own. It is the largest of the macaw species reaching up to 42" in length. It is slow to mature, but is highly social and makes an extremely gentle pet. Hyacinth macaws in the wild are endangered, but they have done well in captivity and are becoming more firmly established today. Hybrid macaws are bred for color. Because they are a mixture of more than one type of macaw, the offspring are influenced by the traits and characteristics of both of its parents. Father's have the dominant gene, so this will generally influence the offspring's coloration and overall appearance. The Caloshua Macaw is a pretty blue bird with the gold's of the Blue and Gold Macaw on its underside and blue greens on its head . The temperament and behavior of hybrids are areas of uncertainty and are unpredictable. But having parents are that are both quite docile and affectionate macaws, the Caloshua Macaw should be a good natured pet bird if well socialized in its developing years. All macaws require good socialization and consistent training to make good pets. See hybrid information, breeding combinations, and photos of hybrid macaws on the Hybrid Macaws page. Scientific Name: The Caloshua Macaw is a first generation hybrid, a cross between: Blue and Gold Macaw Ara ararauna and Hyacinth Macaw Anodorhynchus hyacinthinus. 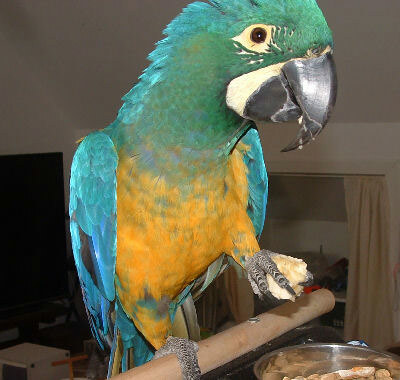 Distribution: ThIs is a captive bred hybrid macaw. Hybrid macaws are rarely found in the wild. Description: Caloshua Macaws are a pretty blue hybrid with a blue green face and a gold or yellow underside. Both parents of the Caloshua Macaw contribute to the blended colors of their offspring, though the father's have the dominant gene and this will influence their final appearance. Caloshua's are a large full size Macaw. The Hyacinth Macaw contributes to the the rich blues as well as influencing the overall appearance of the head and size. The Blue and gold Macaw contributes the lighter blues along with the green shades on the head and the gold on the undersides. The skin tones of the Hyacinth are orangish and they are white on the Blue and Gold, giving a whitish or slightly yellowed skin color to the Caloshua. Size - Weight: A large full sized macaw, they can get over 2 lbs. Lengths up to 106 cm (42 inches). Care and feeding: A roomy cage is required unless the bird is to be let out for extended periods. Many birds can spend most of their time on a play pen or parrot perch. They eat a variety of seeds, nuts, fruits, and commercial pellets, as well as the same nutritional foods humans eat. In the wild, their parent species eat a variety of palm nuts, fruits, and seeds. A Hyacinth Macaw will eat mainly raw nuts. Provide your Caloshua Macaw with nuts and a good parrot mix which includes; formulated diets, seeds, dried fruits and nuts. Nuts you can provide them include Brazil nuts, walnuts, macadamias, filberts, almonds, and hazel nuts. They will also like fresh coconut. They may also be offered fruits and vegetables. For good strong development, babies will need a high fat content in the hand-feeding formula. See About Macaws: Housing and About Macaws: Care and Feeding for more information. Social Behaviors: It is generally believed that hybrid macaws get the best attributes of the parents. In this case, a Blue and Gold Macaw parent makes a good family type bird, and a Hyacinth Macaw is sweet, affectionate and extremely gentle. Hyacinth's are not inclined to make a great deal of noise and have a very even temperament. Breeding/Reproduction: This is a hybrid and it use to be that they were generally not bred, however the breeding of hybrids is becoming more common. See About Macaws: Macaw Breeding, Bird Reproduction - Baby Macaws for information on breeding macaws. Sexual differences: No visible differences. Can be noisy (as can all macaws). See About Macaws: Potential Problems for information on illnesses. Finding these macaws for sale is generally hard as they are rare, and they are expensive. There are more and more macaw breeders however, so finding these macaws for sale becomes easier as they become more common. Be careful Susan. Some folks in here are scammers. I am a victim.